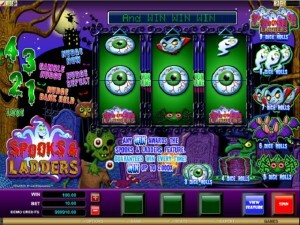 Microgaming offers us in Spooks and Ladders a game with a Halloween ready design, with ghosts, vampires, bats, spiders and monsters being all present on its reels. The main focus seems to be on the ghosts, but there are plenty of other things to spook you in this game. There is also the thing with the ladders, which you will see in the bonus game, the part where you actually make money since the base game only gives you dice rolls for the feature. That’s one thing that few slots do, the fact that it doesn’t give you a prize immediately, instead offering you access to a feature with guaranteed wins. 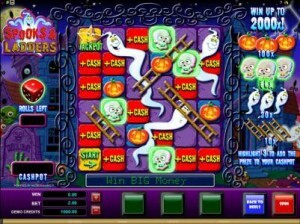 A classic game with a bit of a kick, Spooks and Ladders is a great Halloween choice and it’s also a title with only 3 reels and 1 line. There are nudges in the game, plus you can get access to the bonus feature, which is where you actually earn money, up to $20,000 being offered. The game has nudges of different types to give you, but the focus seems to be mostly on the bonus game, the one that gives you the prizes. While in the base game, the paytable shows you how many dice rolls you get when a combo of three matching icons is created. Between 3 and 9 dice rolls are won, with the help of the 7 symbols. All wins obtained in the base game result in the same access to a feature. These dice rolls are used on the next screen, in a bonus game which shows you a 6×6 screen, with both ghosts and ladders on it. You start from the bottom left corner and the dice rolls will tell you how much you advance on the board. There are ladders along the way, which can help you move over one or two rows. The goal here is to win cash prizes as you advance, by getting three identical symbols, while also reaching the last stop on the board, which gives you a Jackpot. Up to 2,000x can be won in this feature which has its own paytable. The betting system is identical to the one from a number of other slots with a lot of features, Microgaming offering over a dozen such games. The wagers use a single coin, whose value varies between $0.10 and $10. With the help of the dice rolls, the game will offer you payouts of up to 2,000 coins, which for you will mean a maximum prize of $20,000. The scary theme was handled well enough by Spooks and Ladders. The usual images of the graveyard, full moon and the witch on a broomstick are accompanied by different types of spooky monsters and ghosts. It’s actually a very good design for a classic title, 3 reel slots usually having less work put into them from the designers. Symbols: Jackpot (2,000 coins), Pumpkin (100 coins), Skull (50 coins), Ghost (30 coins) and Ladder (10 coins). The game is good enough to be played all year long, but it makes sense especially during Halloween. 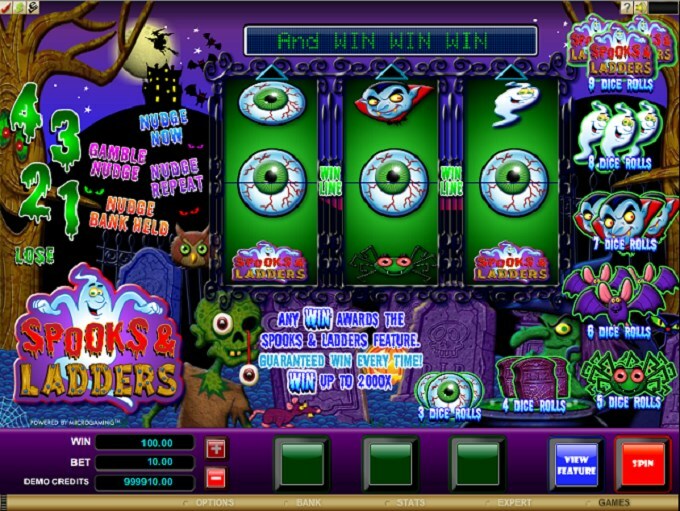 The Spooks and Ladders slot machine is offered through the Microgaming platform, so if you want to play it for real or just to practice, look out for casinos that use it.